I had been running my bootcamp for about a year and my online training was up and running. But I wasn't making enough money. I was undercharging for everything and knew I needed to raise my prices. My business was not sustainable as it was currently being operated, and something had to change. So it was time for me to invest in coaching to help me really figure out what I needed to do to help my business grow and thrive in a competitive fitness market. My number one goal when I started working with Greg was to raise my prices all around. He helped me figure out a strategy to not just raise prices a little, but make some bold and dramatic increases while also maintaining my client base. Working with Greg is intimate and highly personalized. He is fully invested in your business and knows everything about it. And he will push you - possibly past your comfort zone (but that is where the magic happens so go with it) to get the best possible results. And then he will be the first to celebrate with you. Greg is an excellent choice if you are ready to go all-in, and want a coach that makes it seem like he's working only with you (even if you're part of a coaching group). I would recommend Greg to anyone who is in the early stages of a service based business or has been running one for a bit but is feeling lost or stuck. Especially those who are running their businesses independently. It can sometimes feel like you are operating your business in a vacuum, and it can be hugely helpful to have someone outside of your business that is in your corner and can help you work through both the big picture stuff and some of the smaller details. With Greg’s strategic help, I was able to raise my bootcamp (group fitness) rates by 150% - AND keep almost all of my clients at the new rate! I was able to raise my online and personal training rates by anywhere from 50-60%. Additionally, I was able to start fitness coaching as an additional offering of my business, and, during my time working with Greg, I was able to secure six new coaching clients! I would not have been able to do this without the tools and strategies I learned from Greg, along with the confidence I gained through his support. My vision is more focused since I've been working with Greg. I have a greater understanding of who I am as a fitness trainer and coach, who I'm looking to serve, and what I'd like to help them accomplish. As a result, my website has been overhauled and I'm creating more written and video content. 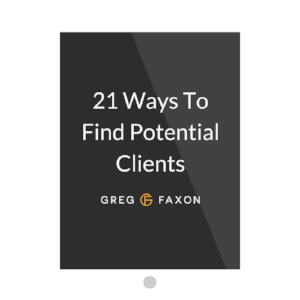 I'm finding my voice and, as a result, I can focus on finding my ideal clients and serve them in the best possible way. You can learn more about Robin at robinlegat.com.